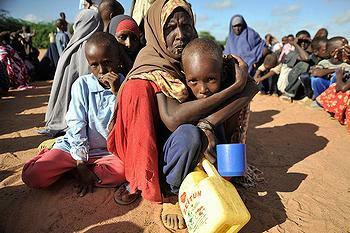 NAIROBI, Kenya, July 6, 2011 (ENS) – The worst drought in 60 years is causing a severe food crisis in East Africa. In Kenya, the world’s largest refugee camp is overwhelmed as 10,000 climate refugees from across the drought-stricken region arrive each week seeking water, food and shelter. The influx of Somalis into refugee camps in the Dadaab area of Kenya’s North-Eastern province has led to worsening overcrowding amid limited resources. The epicenter of the drought has hit the poorest people in the region in an area straddling the borders of Kenya, Ethiopia and Somalia. The UN’s Office for the Coordination of Humanitarian Affairs, OCHA, estimates that 10 million people across the Horn of Africa are caught in a deadly combination of failed rains and soaring global food prices. More than half of the refugees are children. Child malnutrition rates in some areas have climbed to twice the emergency threshold amid high food prices that have left families desperate, the agency says. Supplementary and therapeutic feeding programs are struggling to keep pace with the rising needs. The drought has forced children out of school as both human and livestock diseases spread. Competition for the meagre resources is causing tensions among communities. The Kenyan government has declared the drought situation a national disaster, with malnutrition mortality rates in northern Kenya exceeding emergency thresholds. Drought-related displacement and refugee flows are on the rise, with an average of 15,000 Somalis arriving in Kenya and Ethiopia every month this year seeking help. 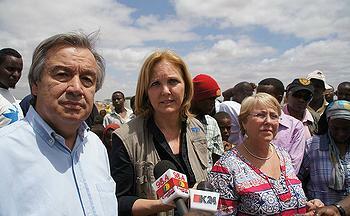 “While conflict has been a fact of life for them for years, it is the drought that has taken them to breaking point. Many have walked for days, are exhausted, in poor health, desperate for food and water, and arriving in a worse condition than usual,” OCHA said in its latest update on the drought situation in the region. In Ethiopia, the consumer price index for food increased by almost 41 percent last month. The price of grain in drought-affected areas of Kenya is 30 to 80 percent more than the five-year average. At least four million bags of maize, or corn, must be imported to avert a massive shortage, the government of Kenya said today. The “Daily Nation” newspaper reports that the country has only about 8.5 million bags on hand, about a two-month supply. Meanwhile, a dispute has broken out among Kenyan lawmakers about allowing genetically modified crops into the country. A legal notice allowing the importation of GM crops was issued Friday. Today, the House committee on Agriculture warned that opening up the country to genetically modified products would endanger lives. Committee Chairman John Mututho said the country lacks the technical capacity to assess the quantity and type of genes in imported products. Further food price hikes area expected in Ethiopia, Kenya, Uganda and Somalia, but could ease after the next harvests expected later this year. OCHA called for the scaling up of the emergency response across the region, urging governments, donors and relief agencies step up efforts to prevent further deterioration as donations are falling far short of targets set by the UN. UN agencies and the partners this year requested $529 million for Somalia, but only 50 percent of that amount has been received. In Kenya, where $525 million is required, about 54 percent of that money has been obtained so far. The appeal for Djibouti is for $39 million, but only 30 percent has been received. “Desperate hunger is looming across the Horn of Africa and threatening the lives of millions who are struggling to survive in the face of rising food prices and conflict,” says Josette Sheeran of the United States, executive director of the UN’s World Food Programme. “It is essential that we move quickly to break the destructive cycle of drought and hunger that forces farmers to sell their means of production as part of their survival strategy,” Sheeran said. Mercy Corps Africa Director Matthew Lovick said, “There is already huge need – and it’s getting worse.” In Ethiopia, Mercy Corps is trucking in emergency water supplies and have expanded its emergency nutrition program to reach more of the worst-affected areas. 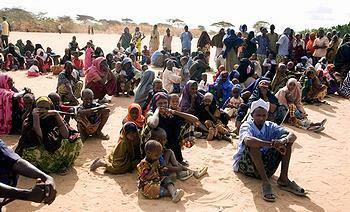 On July 4, the aid agency Oxfam launched its largest ever appeal in Africa. 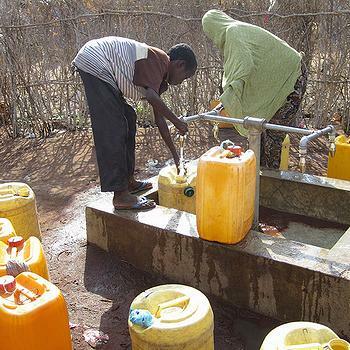 The agency needs $80 million to reach three million people in dire need of clean water, food and basic sanitation across Ethiopia, Somalia and Kenya. “This is the worst food crisis of the 21st century and we are seriously concerned that large numbers of lives could soon be lost,” said Jane Cocking, Oxfam’s humanitarian director. “Two successive poor rains, entrenched poverty and lack of investment in affected areas have pushed 12 million people into a fight for survival. People have already lost virtually everything and the crisis is only going to get worse over the coming months,” said Cocking, using a higher estimate of the number of people affected than that used by OCHA. The aid agency Save the Children too launched an appeal for Africa on July 4. “Large numbers of Somali refugees are fleeing conflict and drought in their homeland and walking to the border crossing point at Dollo Ado. From there, they are taken to nearby refugee camps in southern Ethiopia,” reports Duncan Harvey, Save the Children’s deputy country director in Ethiopia.